I had my best chase of the year today, and all the good stuff was within 50 miles of home - though I ended up taking a rather roundabout route to see it. I had been planning on chasing on this day for several days, and was initially encouraged in the morning as the NAM model continued to indicate an EHI of between 4 and 5 in parts of eastern MO and central IL in the warm sector. However, as the day went on, things began to look less good. The remnants of an overnight MCS moved through the Alton area and points north around mid-day, though I am not sure how much this really reduced later convection since this area ended up having the day's best storms. SPC still had a 15% hatched tornado outlook for much of central and northern IL as well as eastern IA on their 11:30 outlook, but each run of the RUC seemed to be a little less encouraging for a chase. By late morning, the earlier stormy-looking forecasts had dwindled down to much lesser CAPE and helicity, and that in a rather large, poorly defined area of eastern MO and western IL. Still, I had set this aside as a chasing day, and I intended to chase once I could get away from work around 2:00. Moreover, after chasing recently in lousy terrain of MO and northeast KS, I was looking forward to chasing in Illinois' somewhat better terrain (though parts of west-central IL near the rivers aren't all that great, either). I headed north on I-55 around 2:30 figuring I would cut west around or south of Springfield and target an area around or just north or northeast of Quincy. Stopped for a data check at the DTN weather center at the rest area near the Raymond exit. Saw one isolated cell near Quincy, and farther south toward STL, storms already starting to line out. Figured I could continue to my target area and hope that any storms there remained isolated. Cut west on 104 at the Auburn exit, figuring I would go to Jacksonville then decide what to do next. I was becoming increasingly concerned because all of the watch boxes for IL were severe, not tornado, suggesting that the storms were lining out quickly or expected to, and this matched what I could see of the storms to my west and northwest. At the same time, I saw what looked like a more isolated cell off some distance to the SW or SSW. At Jacksonville I was faced with one of those decisions, early in the chase, that make or break the chase. Fortunately this time (and unlike some of my recent chases), I made the right choice this time. The cell off to the southwest was looking more and more supercellular. 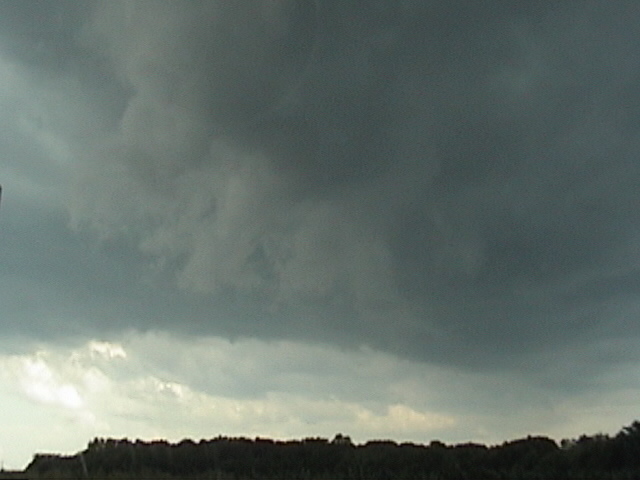 Though I could not see the updraft, it was clearly an isolated storm, with a long anvil extending far downshear (i.e. to the NNE). With the expectation that the storms to my west, which I could now see and had been planning to target, were lining out, or about to, it seemed to make sense to try for the more isolated cell. So I headed down route 67 and then 267 toward Greenfield, and soon found out that the storm was SVR warned. By the time I got to Greenfield, it had gone TOR warned, based on radar indication of strong rotation about 8 miles SW of Jerseyville. 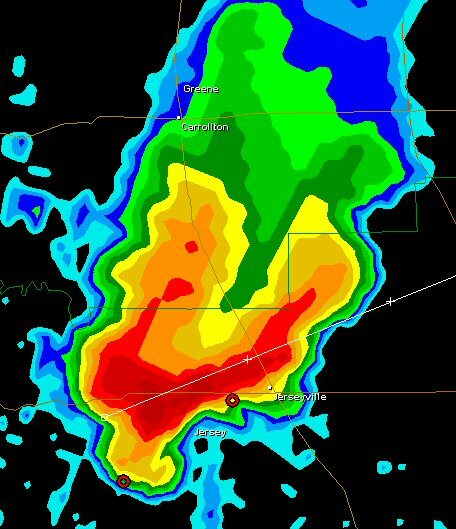 A look at this radar image of the storm near Jerseyville, downloaded by Brad Emel, will help show why the storm was TOR-warned. 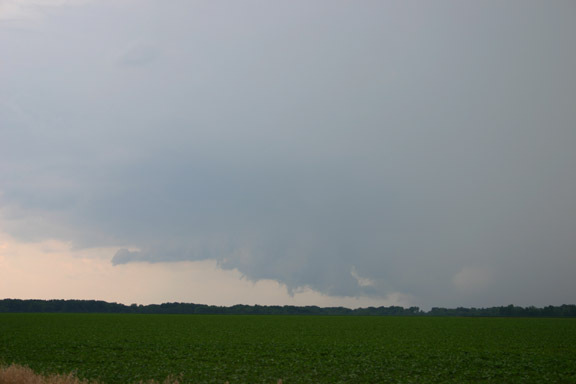 Once I was past Greenfield, I began to be able to see the wall cloud, first through the rain, then more clearly. In hopes of getting a better view, I continued south on a side road at Kemper, where route 267 angles a bit to the SE rather than due south. I stopped somewhere between Kemper and the left turn to Medora and got this photo of the wall cloud with a couple dangly things underneath which I could not tell, from the still-considerable distance, whether they were scud fingers or funnels - but whatever they were, they did not last long. It was around this time, though, that the storm dropped golfball hail on Jerseyville. Soon, realizing that the wall cloud was going to move over me or to my south (placing me in the big hail), I moved on, and upon reaching the road that cuts east to Medora, was directed east on that road by an EMS person who had his ambulance parked at the intersection with the lights flashing to warn people of the possible approaching tornado. At the north edge of Medora, I stopped for a minute or two to watch the storm at the entrance to a ballfield, where people were still on the field despite a massive wall cloud heading straight toward them, and despite the tornado warning that had been issued for the area! Again realizing that I was not yet south of the wall cloud, I continued south, eventually stopping at route 16 3 miles south of Medora. I was now safely south of the path of the wall cloud, and watched in amazement as the drop-dead gorgeous wall cloud passed within a mile or so to my northwest. I got both snapshots and video as the wall cloud tracked E or ENE at around 25 to 30 mph, passing between me and the town of Medora. Northwest of me and southwest of Medora, it briefly formed this lowering (video capture), which may or may not have been a funnel cloud - I could not tell in the low contrast. Later, just around the time it would have gone over route 267, it did form what appeared to be a small funnel cloud (video capture), and I heard a report around 10 minutes later that a spotter reported a tornado a mile or two south of Medora at this time. For some reason, the SVS concerning this that I heard on my weather radio did not make the COD SVS list. I initially tought the LSR reporting a tornado as "north of Brighton" at 5:20 p.m. referred to this report, since the location would be 6 or 7 miles north of Brighton, and there was nothing else going on at the time that could have led to such a report. However, as discussed below, this is not the case, and the two reports apparently referred to different features. At the time the apparent funnel cloud formed, I could not see the ground underneath due to terrain, so I could not say whether this was in fact a tornado. Here is a contrast-enhanced video capture of the apparent funnel, since the contrast had become rather poor at this angle. 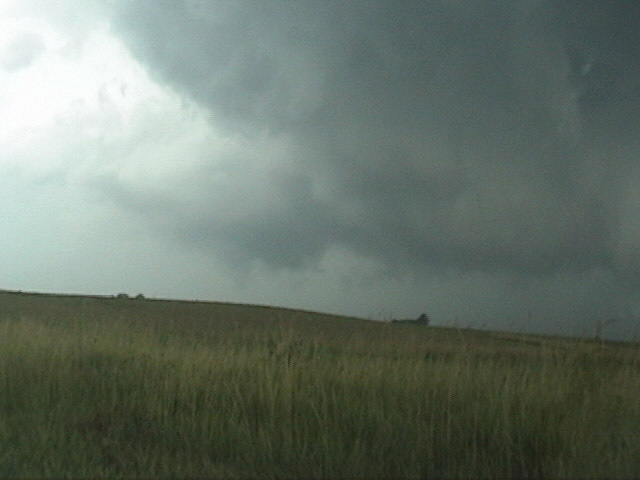 After this, the meso quickly became hidden by rain from this location, and it was time to head east on route 16. 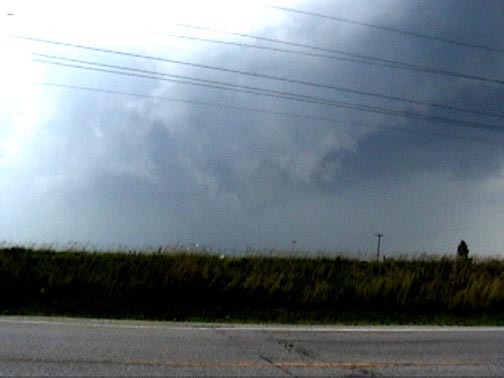 During the time I was observing the main wall cloud to my north, and just before the formation of the apparent funnel, I turned my car around to face east so I could move when necessary. As I did so, I noticed a lowering with violent motion to my south. It did catch my attention and I got about 10 seconds of video of it, but because it was away from the main wall cloud, or at most on the far southern fringe of it, and under the flanking line/gust front not the main meso, I thought relatively little of it. 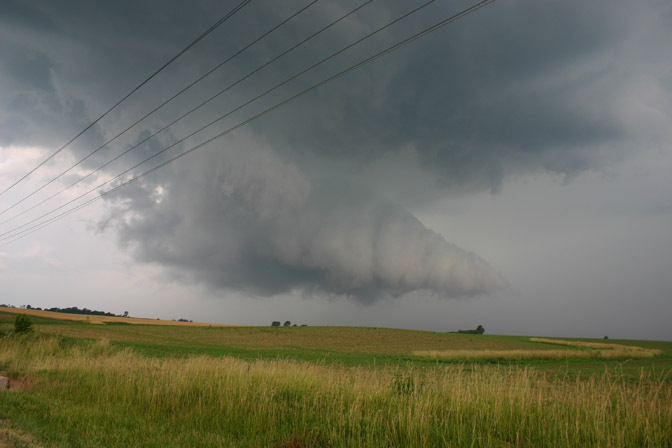 Hence, I was extremely surprised when the NWS damage survey issued on June 15 showed that this feature to my south, not the wall cloud and funnel to my north, was associated with the tornado, which in fact occurred about 2.5 miles north of Brighton and 2 miles south of my location. The tornado had a half-mile damage path and damaged several trees and power poles. Here is a video capture of the feature associated with the tornado - given the location to my south or SSE, as best I can remember, this would have been about at the east end of the tornado's damage path. I really am very surprised that the tornado occurred here - while the feature I observed did have upward motion and some rotation, and could in fact have been a funnel with some scud around it, it did not look tornadic nor was it in the part of the storm that one would have expected to produce a tornado. I am irked that I had my back to it during much of the life of the tornado, yet I think anyone would have expected a tornado to be more likely under what was obviously the primary meso/wall cloud. By the time I got east to between Piasa and Shipman, the main wall cloud, now 2 or 3 miles to my north, had formed an inflow tail on the southeast side. Again it disappeared in the rain, so I headed east and cut north at Shipman for a better view. 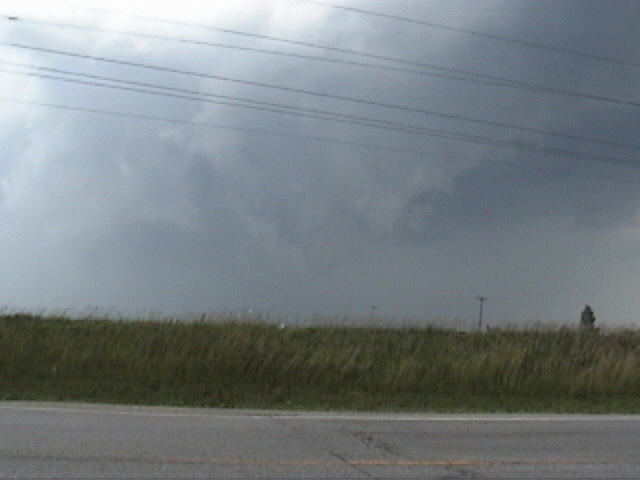 At that time, the meso wound up again, with rotation quite evident for a few minutes until it occluded. At this time, the storm also had a very long, impressive beavertail extending off to the east. With the storm showing signs of cycling and some violent cloud motion under the flanking line which was almost overhead, I decided I needed to get east again. (Given that it turns out the same part of the storm had produced a tornado minutes earlier, this turns out to be a very smart decision!) By the time I got to Royal Lake, where route 16 intersects with route 159, I knew it was about time to leave the storm. I was hearing reports of a violent bow echo coming into northern Madison and southern Macoupin Co, with a history of and potential for wind to 80 mph. I figured this line would 1) overrun my supercell and put an end to it, and 2) cut off my return route south to Edwardsville if I did not leave the storm and head south on 159 pronto. Accordingly, I did. I got caught in slow traffic in Bunker Hill and a couple miles south of there, was overrun by the bow echo storm. Right as the gust front first hit, I saw several small branches go flying from a tree a quarter mile ahead, and that was enough to convince me to stop and ride it out on the shoulder. I got about 10 or 15 minutes of heavy rain and strong but probably non-severe wind, perhaps 50 mph. I was clearly south of the apex of the bow, and soon the precipitation cleared to my south and, although I could see the shelf cloud surging ahead to my south and east, I had little or no rain the rest of the way back to Edwardsville, even as the rain and wind surged east toward I-55 behind me. The very high winds passed just a few miles to my north, causing widespread tree and powerline damage in Bunker Hill and bringing down two power poles along 159 a couple miles north of Bunker Hill. In fact, the NWS damage survey determined that some of the damage both in Bunker Hill and 2 miles north was caused by tornadoes that spun up under the leading edge of the bow echo. Even greater damage, including buildings unroofed, was caused by both straight-line winds and another tornado along the apex of the bow echo a little farther east in Wilsonville. As earlier, these tornadoes occurred in a situation where I would not have expected them, right along the leading edge of a very fast-surging bow echo. Part of me wonders if they were gustnadoes, yet I know from both the BAMEX research and my own experience last July 5 that true tornadoes can and do occasionally form along the leading edge of a bow echo, especially at the apex, which was near or just north of Bunker Hill. At least one witness east of Wilsonville did report seeing a tornado over that town as the gust front swept over. 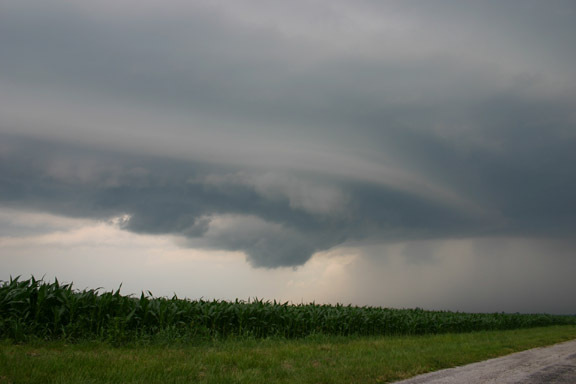 This was an excellent chase - it is not often you see such a photogenic, classic supercell in Illinois. And, for once, when confronted with that make-or-break early-chase decision, I made the right one! I only wish I had looked behind me more, both while watching the wall cloud between Brighton and Medora and while waiting out the bow echo south of Bunker Hill. Here are the local storm reports for this date. The reports for times between 4:45 and 5:30 in Jersey, Greene, and Macoupin Counties are for the supercell I was on. Reports from Jersey, Macoupin, Madison, and Montgomery Coutnies between 5:45 and 6:45 are for the bow echo. Here is the public information statement from the St. Louis NWS.